Growing my own tempeh has been on my list of things to try. I have recently received a free sample of tempeh starter from Tempeh Info. So way I go to give it a try. I was a bit nervous to keep a constant temperature of around 30deg C to incubate the beans. I don't want to spend ££ to buy/build an incubator, so I racked my brain and find what I already have at home. I started gathering a few items like an electric plant propagator sitting in the cupboard, an old glass thermometer and a portable light. If you have a way to keep the beans in a warm area around 30 deg C then an incubator is not required. a rack put inside the propagator tray to enable air circulation on bottom side of the bags during fermentation. a thermometer to check temperature, able to read 20 - 40 deg C easily. I used a traditional glass thermometer, you can use any cheap thermometer like a room thermometer or a probe. portable light with a 40 watt bulb for extra heat when needed. some string to tie the light fitting on the inside of the propagator lid. Make sure the light bulb is not in contact with the lid to prevent heat damaging the plastic. a small piece of sticky tap to seal the vent on the lid, remove when temperature gets higher than required. Now that I have an incubator, the next thing to do is soak and prepare the soy beans. Instructions how to make tempeh follow this link. I used two heat sources, one from the electric propagator and the other is a light bulb tied to the inside of the lid. To conserve heat I also covered the incubator (propagator) with a blanket. A thermometer put on top of the beans to check temperature. With all this preparations my incubator has maintained a regular temperature around 30 - 32 deg C for the first 12 hours. After that I noticed the temperature has risen to about 34 - 35 deg C. I then turned off the light leaving the propagator on only. This has perfectly maintained the right temperature for the remaining incubation time. During incubation time, check temperature every few hours or as often as you can. During the first 8 -10 hours the beans need to absorb heat, after that they will give out heat once fermentation is well on its way. open the lid for few minutes to cool then put it back on and continue. During the first 8 -10 hrs there was nothing much happening. The beans absorbed the heat from whatever heat source given. Gradually as the beans getting warmer condensation seen on the inside on the bags. By about 12 - 13hours, temperature rose quite high due to beans giving out their own heat during fermentation. By about 24 hours, the white mold has grown much thicker and beans have stuck together forming a firm piece. By 30 hours, both bags have become solid matured tempeh ready for harvest. I was very pleased my first batch of tempeh has turned out to be very successful and harvesting time was much shorter than instruction given by the starter's manufacturer. I will definitely make more tempeh from now on. The tempeh looked just like a piece of creamy white nougat, no black spots. It has no odd smell quite nice kind of mildly nutty and mushroomy. 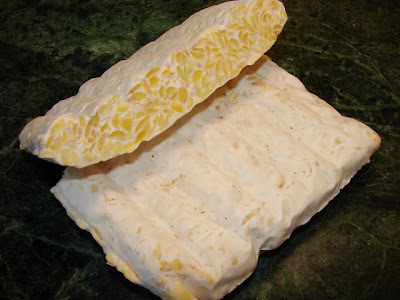 The white mould feels just like that on a piece of brie. One thing I will improve in future is the shape of the tempeh. I will try to make the tempeh thicker into a loaf or log shape block. Maybe I will try wrapping the beans with banana leaf like the traditional method. Making tempeh is not difficult. The worst job was dehulling the beans which took a bit of elbow grease and time. The proof of the pudding is in the eating as they say. I will post the taste test and recipes later. Thanks for this!! Have been looking a a recipe for tempe...I love it! !